40G Solutions: Duplex Fiber or MPO/MTP Fiber? There’s been a lot of talk lately surrounding bidirectional 40 Gb/s duplex applications, or BiDi for short. Currently offered as a solution by Cisco®, BiDi runs over duplex OM3 or OM4 multimode fiber using QSFP modules and wavelength division multiplexing (WDM) technology. It features two 20 Gb/s channels, each transmitting and receiving simultaneously over two wavelengths on a single fiber strand – one direction transmitting in the 832 to 868 nanometer (nm) wavelength range and the other receiving in the 882 to 918 nm wavelength range. Avago Technologies also offers a similar QSFP BiDi transceiver. Unidirectional 40 Gb/s duplex fiber solutions are available from Arista and Juniper. These differ from the BiDi solution in that they combine four 10 Gb/s channels at different wavelengths – 1270, 1290, 1310, and 1330 nm – over a duplex LC connector using OM3 or OM4 multimode or singlemode fiber. These unidirectional solutions are not interoperable with BiDi solutions because they use different WDM technology and operate within different wavelength ranges. While some of the transceivers used with these 40 Gb/s duplex fiber solutions are compliant with QSFP specifications and based on the IEEE 40GBASE- LR4 standard, there are currently no existing industry standards for 40 Gb/s duplex fiber applications using multiple wavelengths over multimode fiber – either bidirectional or unidirectional. There are standards-based 40 Gb/s applications over duplex singlemode fiber using WDM technology, but standards-based 40 Gb/s and 100 Gb/s applications over multimode use multi-fiber MPO/MTP connectors and parallel optics (40GBASE-SR4 and 100GBASE-SR4). Due to the aforementioned risks and limitations of using non-standards-based 40 Gb/s duplex fiber solutions, we recommends following industry standards and deploying 40GBASE-SR4 for 40 Gb/s applications today. While this standard requires multiple fibers using an MPO/MTP-based solution, it offers complete application assurance and interoperability, as well as overall lower power consumption. Furthermore, TIA and IEC standards development is currently underway for wideband multimode fiber (WBMMF), which is expected to result in a new fiber type (potentially OM5 or OM4WB) that expands the capacity of multimode fiber over a wider range of wavelengths to support WDM technology. While not set in stone, the wavelengths being discussed within TIA working groups are 850, 880, 910, and 940 nm. Unlike current 40 Gb/s duplex fiber applications, WBMMF will be a standards-based, interoperable technology that will be backwards compatible with existing OM4 fiber applications. WBMMF is expected to support unidirectional duplex 100 Gb/s fiber links using 25 Gb/s channels on 4 different wavelengths. WBMMF will also support 400 Gb/s using 25 Gb/s channels on 4 different wavelengths over 8 fibers, enabling existing MPO/MTP connectivity to be leveraged for seamless migration from current standards-based 40 Gb/s and 100 Gb/s applications to future standards-based 400 Gb/s applications. Now fiber optic transceivers are commercially available for almost all international and industrial standards, including Ethernet, Fast Ethernet, Gigabit Ethernet, 10Gbit Ethernet. 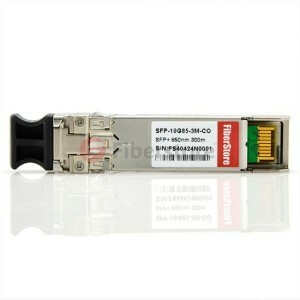 What’s take an important role in this situation is SFP fiber optic transceiver. So let’s take an eye on it. SFP is also called small form-factor pluggable which is a version of Mini GBIC. at first sight, you can find the size is only half of GBIC. It supports data rates up to 10 G. The SFP Transceiver are available with a variety of transmitter and receiver types. What’s more, it is with LC interface. The kind of SFP transceiver module called SFP-10G-SR in Fiberstore is a quite well choice, it is nearly same as Cisco SFP 10G SR. SFP is regarded as a hot pluggable module, this make it Effortless to alter and effortless for upkeep in comparison with conventional modules. It makes the Ethernet network easier to upgrade and sustain. End users can replace a Solitary SFP module Throughout the Procedure Rather of replace the complete board with various modules on it. SFP+ twinax cables are copper cables with two SFP+ transceivers attached on either end. This SFP cable is also known as Direct Attach Cables (DAC). Using twinax cable is significantly cheaper than connecting devices using two 10 Gbps fiber optic transceivers over fiber cable. There are two types of twinax cables. active and passive. In IBM b-type switches only active cables are supported which contain Vital Product Data (VPD) information. Twinax cable is available in length of 1m, 3m, and 5m. Also referred to as twinax, a direct-attach twinaxial cable is very similar to coaxial cable, except for one additional copper conductor core. Both twinax cores are protected by an insulator layer and another metallic conductor surrounding the core pair. Analogous to twisted-pair cables, both cores are twirled together to diminish interference effects from outside sources. Originally created by IBM for shorter-distance connections, twinax cables offer a cost effective way to interconnect Ethernet devices within racks and across adjacent racks. These cables are usually accommodated into the transceiver housing of a switch or server. Direct-attach 10 Gigabit Ethernet twinax cables have Enhanced small form factor pluggable (SFP+) compatible connectors while 40 Gigabit Ethernet twinax cables deploy Enhanced Quad small form factor pluggable (QSFP+) connectors. On both data rates, twinax cables are available in the following types. Active: Have components in the SFP+ or QSFP+ housing to improve the signal quality. Usually covers 7 and 10 meters. Passive: Have straight conduction between devices and are available in 1, 3, and 5 meters. for example Cisco SFP-H10GB-CU1M and what SFP-H10GB-CU1M in Fiberstore has same functions with Cisco’s and it also fully compatible with Cisco devices, the same time the price is lower than Cisco’s. Twinax cables have achieved high popularity in data centers because of their high benefit/cost ratio. As an additional advantages, twinax cables present a much lower bit error rate (1 error in 10 E18 bits transmitted) than the IEEE requirements for 10 Gigabit Ethernet connections (1 error in 10E12 bits transmitted). Although the 2004 IEEE 802.3ak standard was the first to introduce 10 Gigabit Ethernet in Twinax cables (10 GBase-CX4), this superseded solution was based on infiniband twinax cables, The twinax cables currently used in 10 Gigabit Ethernet are standardized by the small form format committee standard SFF-8431 and 8461. Although the Ethernet standardization process has its fair share of politics, the study of its timeline remains a good way to access the networking industry trends over the last three decades. we can see some trends, such as twisted-pair roughly increased ten times its data rate every five years. That pace, however, did not continue in speeds higher than 10 Gbps. Optical fiber had a slightly faster development, being the first media to support data rates higher than 100 Mbps. It also presented the highest longevity among all media. Twinax cables have risen as a viable Ethernet option for 10-Gbps connections. Because of the higher cost of optical transceivers, fiber is typically employed on links between switches, where higher speeds are required the earliest. High-volume connections, such as server access, depend on lower costs to justify an upgrade to faster data rates. For that reason, twisted-pair and direct-attach twinax cables have been the most popular choices for these connections. At last, The above information are come from Fiberstore fiber optic manufacturer. Go ahead to check out the details! And the same time there is a good news is that Fiberstore is making a 30% discount about most products, welcome you to visit our online store.